Perched on the outskirts of the Cairo, the pyramid is easily accessible to any wanderer who wishes to visit the last remaining wonder of the ancient world. This gargantuan tomb was constructed about 4,500 years ago and has stood the test of time, becoming a symbol for Ancient Egyptian culture. With an estimated 2.3 million stones blocks, scientists and archaeologists today are still unsure HOW the ancient Egyptians were physically able to build this mammoth structure. Egypt has over a hundred pyramids, but the Great Pyramid is by far the largest of them all, in fact it is considered one of the largest structures ever built. Pharaohs were believed to be somewhere between humans and the divine, and as such their burial was highly significant. The pyramids’ angled sides pointing towards the sky were designed to aid the Pharaohs soul ascending to the heavens. Tombs were filled with treasures and valuables, to bring with them into the afterlife. 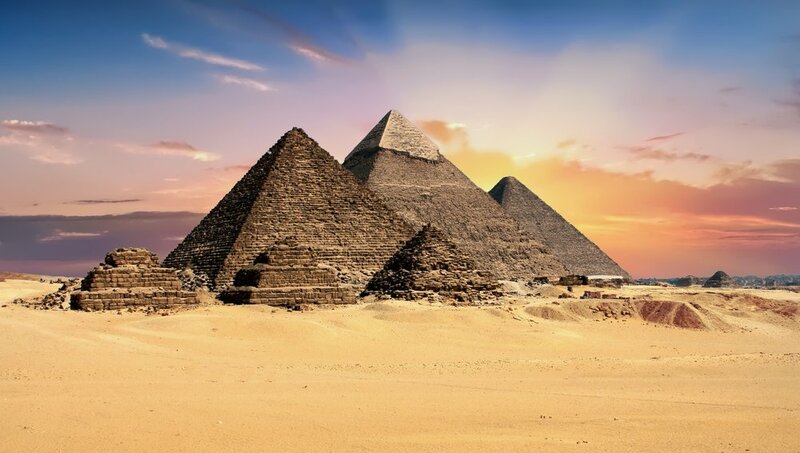 This fact has intrigued explorers for hundreds or years, and many have devoted their lives trying to discover hidden pyramids and their accompanying treasure. Also referred to as the Red Rose City and the Lost City! Although the site is 3000 years old, it was not discovered by western civilisation until 1812, but has since become world renowned as one of the Seven Wonders of the Modern-Day World. The Ancient City of Petra is nestled in a canyon called the Siq, accessible by a narrow gorge which would have been easy to defend, but also allowed the site to stay hidden. The whole city is carved into the mountains, and the combination of nature and architecture is truly breathtaking. This sight should shoot to the top of your bucket list! The city was founded by the Phoenicians in 7th Century BC, but was later expanded under the Roman Empire’s control. The site was majorly excavated by the Italians in the 1930’s and, it is the Roman architecture and influence that we can still see prominently in the ruins of this abandoned city. As can be expected from former Roman settlements, there are the classic amphitheatres, mosaics and bath houses. 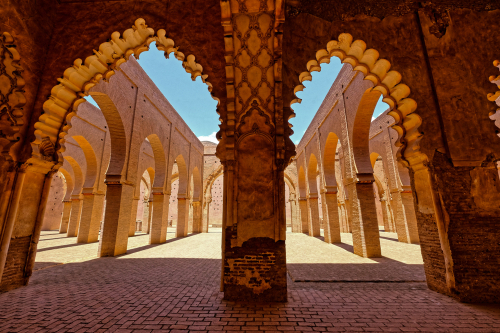 Conflicts in Libya have halted tourists interest, but hopefully when the country becomes a less high risk location it will bloom into being the tourist hot spot it deserves. If you feel drawn to the mystery of the Egyptian pyramids but would like to avoid the accompanying hoards of sightseers, a trip just south of the border to Sudan might be the perfect solution. These pyramids are deep into the arid sudanese desert, 3 hours from the capital city of Khartoum. For an authentic and unforgettable experience there is a nearby camp, equipped with safari tents, beds and a beautiful view of the pyramids along the horizon. These pyramids are distinctive from those in Egypt, although they are remnants of the Ancient Egyptian civilisation they have been plundered with most of the tops destroyed, in search for treasure. The prison island that Nelson Mandela was imprisoned in for 18 of his 27 year sentence, and just a short trip from the coast of Cape Town. The island was first used a prison in the 17th Century, but was also used as a leper colony and for quarantine purposes. It is known for having isolated mostly political prisoners, and in fact a total 3 former inmates of this prison went on to be President of South Africa. This cultural and historical significance has lead it to become a UNESCO Heritage Site. Since the end of the apartheid the island has been converted into a museum for tourists, you can even enter Nelson Mandela’s former cell! One of the most famous landmarks in Africa, the Great Mosque of Djenne is constructed of earth bricks and then coated in plaster, but it is the sticks which adorn the exterior walls that makes the design so distinctive. Indeed, these sticks have a practical use to them; they are permanent scaffolding for regular maintenance and repairs. During an annual festival the city’s citizens all contribute to re-plastering the mosque, working together with pride to maintain the buildings condition. The mosque is situated on a flood plain, and as such is built on a platform to protect from water damage during flooding, towering above the rest of the city. A partially excavated historical site, it was founded by the Berbers but expanded under the Romans’ rule. The ruins show predominantly Roman architecture including an impressive basilica, remnants of a temple, beautiful arches, and intricate mosaics from the wealthiest citizens’ fine townhouses, all still well preserved. Some damage to the ruins was caused by an earthquake in the 18th century, but throughout the French colonial period the site was restored and rebuilt. King Lalibela instigated the construction of 11 monolithic churches, allegedly in attempt to build a ‘New Jerusalem’. There was unrest and conflict, with Muslim conquests making Christian pilgrimages to the holy land difficult. These churches’ existence is predicated on a difficult historical situation, unusually carved into the mountains surface these buildings are actually subterranean and many are linked together with a tunnel system. They are worth the visit, with bold designs unlike any church you’ve seen before. One of the most interesting Mosques in the world, and one of the few you can visit as a non-muslim. In fact it is one of only two in Morocco open for anyone to see. It was built in 1156 but has since been abandoned, and as such no longer has a roof. The openness of this mosque has resulted in faded decor, and yet the Mosque still maintains its grandeur; the ornate detail remains on the vaulted pillars and impressive arches. Hidden deep in the Atlas mountains, it is far from most ‘tourist’ towns, making it a real hidden gem. With strong currents and countless reefs, the Red Sea has been difficult to navigate for hundreds of years. As such, it is home to a plethora of shipwrecks, and hence has become a popular diving site. The most famous ship to visit here is the SS Thistlegorm. This British Vessel was carrying a variety of war supplies, including armoured vehicles, railway wagons and motorbikes, when it was sunk in 1941 during World War II. The Thistlegorm had completed just three successful trips before her final voyage, and was headed for Alexandria when she was hit. What type of trips are you drawn to? Would you rather visit a historical site, a natural wonder, or perhaps a new and exciting city?